We hit another milestone today with the first turn on our now now finalized route. This was also the first day we had no idea what was next until we got there. Despite the uncertainty we still ended up with seven adventurous and hungry lunchers. As we turned off of Jackson onto 8th we spied the KC Kitchen and entered with hopes running high. Do they use MSG? : We were told "No." But my body is saying "Yes". Holy good god this place was bad. Not quite Ga Ga Loc bad (you'll hear about this place soon enough) but the food was a shade better than cafeteria food at a Hong Kong prison. The "Grand Opening" sign and the decor draws you in, it's quite nice on the inside, and bonus points for the plasma on the wall showing crazy Taiwanese game shows. The lazy susan had recently been wiped down with a paper towel, which also made me happy. It was getting excited. The menu had some expensive specialties, like Shark Fin soup for $28, which intrigued me, but was outside my normal lunch range. 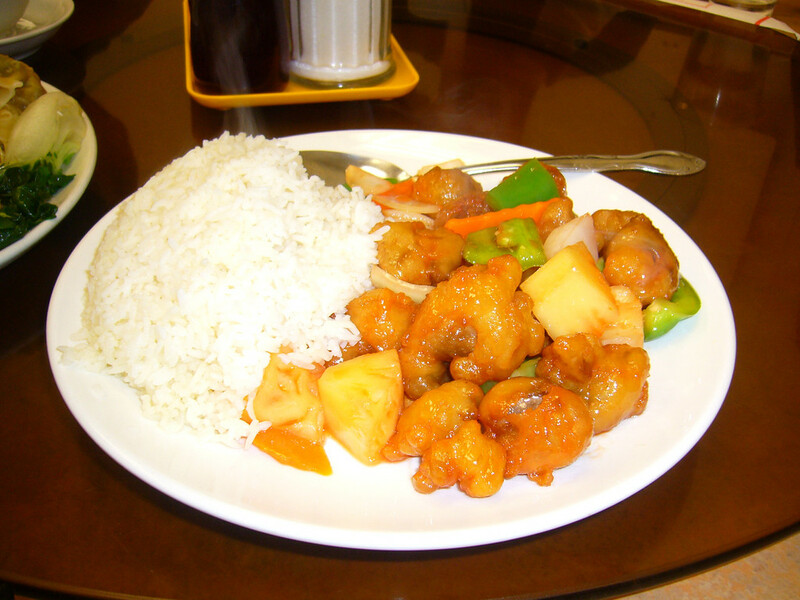 I decided to limit myself to the lunch menu, and after much waffling settled on the Sweet and Sour pork. The food came, looked presentable enough. The pork was breaded and smothered in that red corn syrupy goodness. Unfortunately the meat was bland, the temperature wasn't piping hot like I'd expect fried food to be. A piece of the fried pork, was in fact, HALF RAW. According to most US physicians, trichinosis has largely been eliminated from US pork but seriously guys, seriously. That doesn't mean I want Sweet and Sour Pork Tartare. I sampled the rest of the cuisine, below average to average. Enlightened indeed. Looking forward to Green Leaf. Fortune: Someone will offer you good advice. Wow! Finally a Chinese restaurant with a lunch menu full of the same old crap. Maybe I'm alone on this, but I'm tired of this stuff. I'm really feeling the shackles of rule #2. I need to find a loophole. 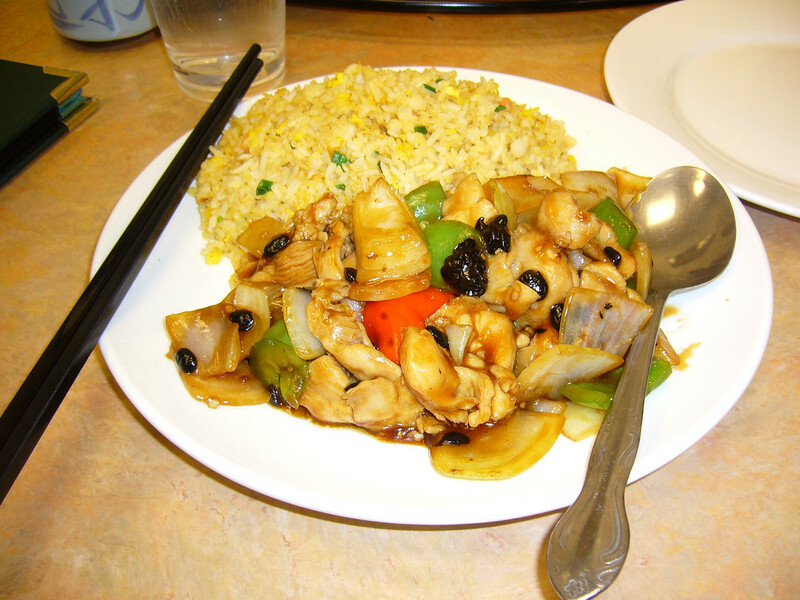 KC Kitchen is bright, clean, and nicely appointed with fairly typical Chinese restaurant decor. It doesn't, however, seem to be a very popular lunch spot. There was only one other table there during the entire lunch. I suspect that since the other table was three older Chinese folks eating off of the regular menu a good lawyer could argue that rule #2 would allow me to order off of regular menu. I'll see if I can pull that off at the next spot. I ordered lunch special #1, the Chicken in Black Bean Sauce with fried rice and hot and sour soup. The soup had lots of good stringy and chunky bits in it and was not overly thick. It would have been exceptional if it had had more tang or spice or something but in the end was just a little too bland. The fried rice was fine and the chicken was typical. Luckily we chose to eat family style and I got good tastes of most of the other dishes. 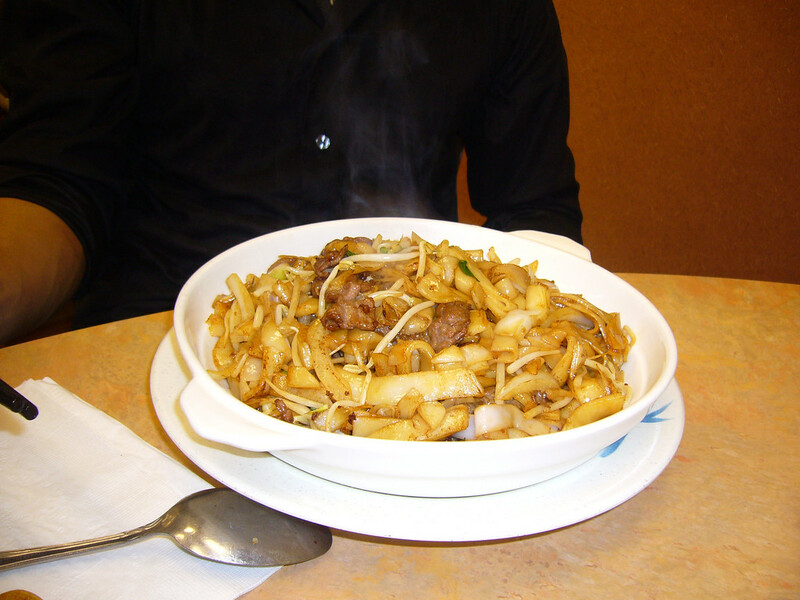 Joey ordered Beef Chow Fun off of the regular menu and turned up the best dish. The dupmlings in Michael's dish were good, but the noodles were boring. Others raved about the General Tso's Chicken, but I have a deep prejudice against sugar covered meats. It tasted just as crappy as I expected. Luckily I didn't even try the Sweet and Sour Pork. If you're coming for lunch you can expect the typical Chinese restaurant lunch fair standing up tall in the middle of the bell curve. There's nothing too wrong with the lunch at KC Kitchen, but there's nothing too right either. I honestly had no idea that this place existed. We were walking up Jackson Street wondering if there were even any restaurants on the east side of 8th Ave. There are, and KC Kitchen was the first place we came to. Walking into the restaurant is quite reassuring. A lot of the restaurants on our tour are going to be sketchy and have marginal health code reputations, but KC Kitchen was well lit, had clean tables, clean floors, and a clean bathroom. 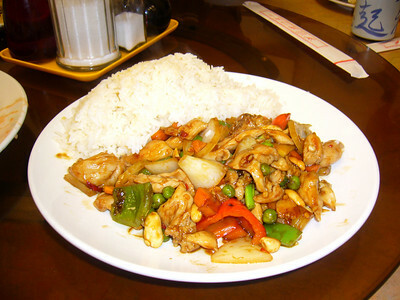 Sticking to the rules of the lunch, I ordered the General Tsao Chicken lunch special. Of course it came with a soup, so I got Hot & Sour. At first glance, the soup looked like it was going to be good: the soup was full of egg, vegetables, and other Chinese goodness. Then I gave it a taste, and was kind of disappointed. The soup wasn't nearly as pungent, spicy or flavorful as I would have hoped. I guess it turned out to be standard. Then my main dish came out, not only did it look different but it also tasted different. This was the least battered and fried General Tsao Chicken I've had and it was actually pretty good, but it lacked the crispness I've come to expect. 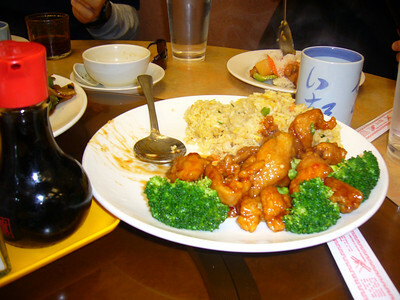 It was better than a standard General Tsao, but not enough to warrant a special trip here. When I applied my standard amount of hot sauce, I noticed that their sauce was really salty. Well lit and clean establishment. Standard food. Salty hot sauce. Fortune: Many possibilities are open to you. Take advantage of them. I thought this was the place my friend told me wasn't very good, but I didn't recognize the name KC Kitchen. Since it had a grand opening sign, I figured the other place musta shut down. So I was a little more hopeful that this food would be decent... I almost bailed and went to Green Leaf next door. The first thing I was impressed with was the bathroom. It had been fairly well remodeld with new tile. I was disappointed however that the urinal would not flush... despite that I give the bathroom a 4/5 rating. Now, onto the food. I ordered the beef chow fun. It was pretty good, but mostly standard from what I've had before. I've had worse, but this pretty much met expectations. The beef was pretty tender, and was the best part of the dish to me. Out of all the other dishes that were ordered, I'd say mine was the best. The General Tso's was "aight". Next! Fortune: You will be presented with a promising business plan. After watching the videos playing on the wall at this fine establishment I have a new goal in life: To be trapped in a small phone booth with 3 hot young Asian women all wearing very short shorts while a giant balloon is inflated until it pops. How awesome is that? Also the food here was pretty great. The Generals Tso's chicken tasted like it had actually been made from scratch and not just some crappy sauce out of a can. and my Noodles with Dumplings is calling me back for seconds. And that beef nooodle thing was very tasty. I will eat here again. Fortune: You will find fortune. Minimal vegetarian options. Tofu-ified the beef with broccoli lunch special, but I believe I chose poorly. 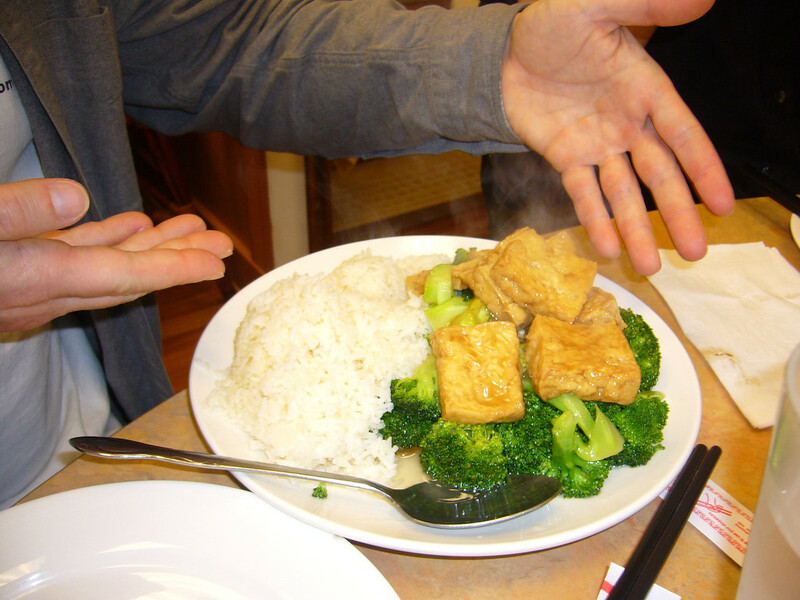 The tofu with broccoli dish was mostly bland and needed generous helpings of chili sauce to make it interesting. 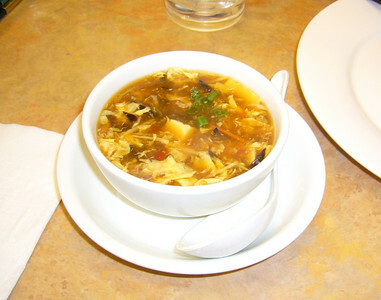 I did like the hot and sour soup, though -- not too thick and lots of stuff in it. Fortune: You will hear from an old friend. 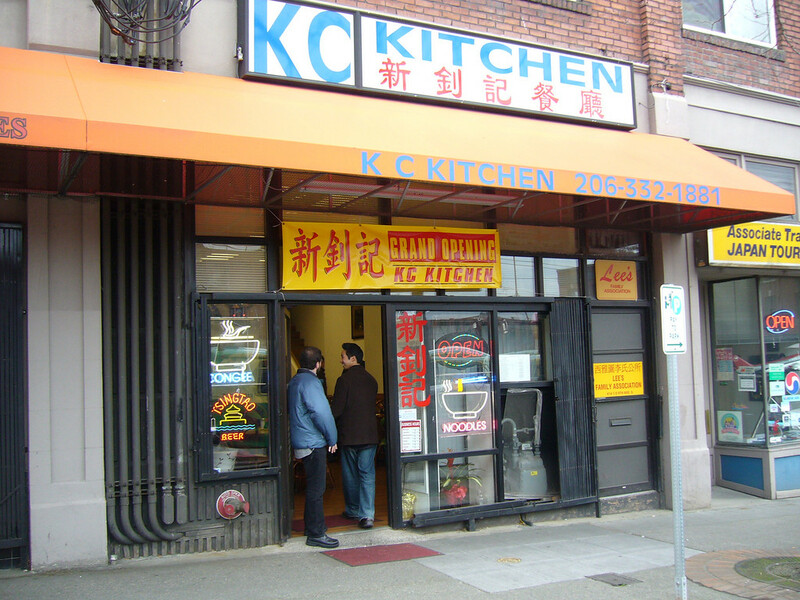 I've eaten at KC Kitchen several times, and the food has always been good. But then again, I never order the lunch specials because I know better. Singapore fried rice noodles, pickled veggie & pork noodle, beef chow mein, all good dishes. If you stick to the lunch special menu, you're always going to be disappointed. 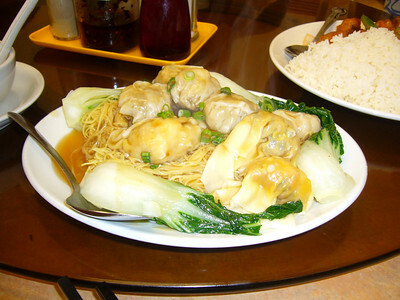 There's more to Chinese food than hot & sour soup and General Tso's chicken. They have, hands down, the best salt-and-pepper squid that I've tried in Seattle, but nothing else on their menu has caught my tastebuds' interest. The wonton noodle mein is so tasty i wanted too eat more and I can its only 3.50 I know right so cheap but ssssooooo GGGGOOOOOOODDDDDD and when I ordered the silver fish so beautiful i would kiss it if i can salty fresh and 8.00 yum yum I would like too come here more than jade garden even though they searve dim sum and the decorations at kc kitchen (BEST FOOD PLACE EVER!!!!!! )has a nice restroom too clean tiles at jackson street 8th ave south ill be there everyday and come enjoy chat with your friends have a reservation there phone number is (206)3321881 thats about all of my time see ya.